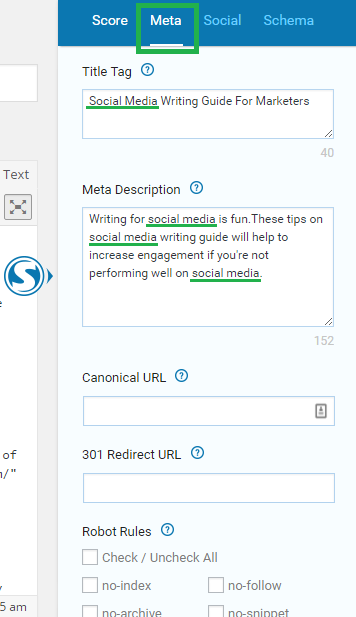 In the previous tutorial, you explored the new user interface of SEOPressor. Now, we will show you on how to improve your content for a better SEO. Here, we have a blog post titled “Writing For Social Media”. As you can see, the score is not perfect yet. So how do I make it better? Let’s try to make it to a healthy 80% score. Step 1: Click the Suggested Optimization ‘expand button’ to get suggestions on how to increase your score. You will see the Red fonts first, followed by Yellow fonts, and Green fonts. Red represents the errors in your content that you should try your best to fix it in order to get a higher score. Yellow represents the warnings in your content that can still be further improved, but you can choose to skip, depending on circumstances. 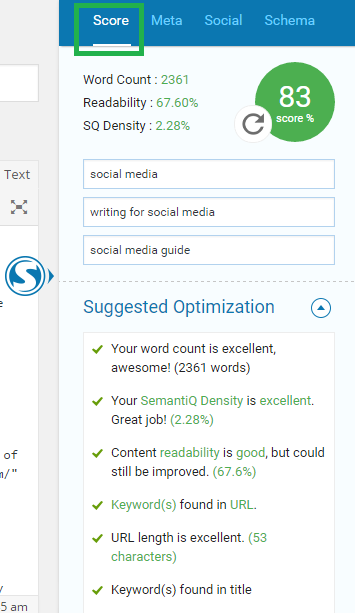 Green shows that you have optimized your content nicely. Well done! 1) Moving the keyword(s) from the back to the front of the title. 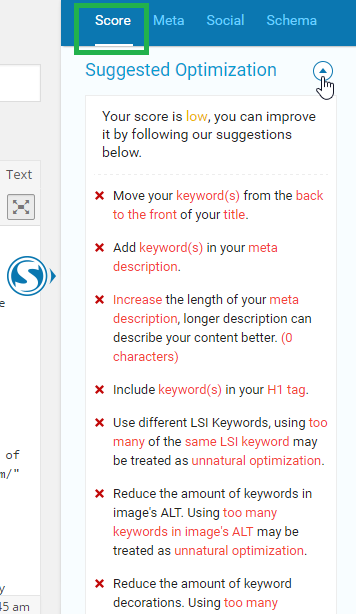 2) Add keyword(s) in Meta Description, and increase the length of Meta Description. 3) Include keyword(s) in H2 tag. Now that we have made some changes based on the Suggested Optimization, let’s refresh the score. Our score has improved to a healthy 83%! Your score will turn green when it’s healthy, and it will turn gray when it’s not. If you need any further assistance, kindly contact our support team.